I suggested a man standing on a mountain top with his hands raised upward to the sun. The title of the book comes from the name of a famous statue at Allerton Park at Monticello, Illinois. The statue of Apollo there, called “The Sun Singer,” has his hands upraised as though saluting or singing to the sun. My cover idea was four-color; the publisher improved on this (and also saved money) by coming up with this duotone. The publisher’s artist drew the actual cover and thought of the colour scheme. My input came in the form of a one-paragraph suggestion when I submitted the book. Once I saw a proof, all I needed to do was to ask for a few changes in the way the type was placed. I saw the statuary at Allerton Park when I was very young—in grade school, I think. It had a haunting impact on me partly because of its scope and setting and partly because of the violent thunder storm that occurred when the family was leaving the park. The statue of Apollo, while not frightening (like all the Fu Dogs), had the greatest impact, probably because as a child the concept of singing to the sun was at once very strange and very bold. I wanted the cover to capture, not Apollo, but the feeling a climber gets when he reaches the summit and stands there in the sunlight looking at the world below. The publisher doesn’t disclose this information. The sun is almost blinding. The primary action of the book is set in Glacier National Park, Montana, though—since the book is a fantasy—I don’t mention many real place names in the story. While the cover art is a generic mountain, my intent was that the cover give one the feeling of being on top of the world. Glacier National Park is variously described as “the backbone of the world” and “the crown of the continent.” I wanted to celebrate that. The "Ladies of Class" cover has the ambiance one might associate with the word "class," so it works in multiple ways. 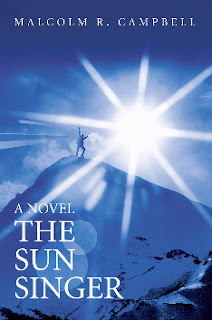 Thanks for your kind words about "The Sun Singer" cover. Of Scots descent, way back, but when I was in school, many spellings no longer around today were in vogue, and that included spelling "labour" with a "u" in it. The dictionary I had in those years is still around, and it lists "today" as "to-day" and "Halloween" as "Hallowe'en." Times change faster than I do. In my spelling comment, I meant to day "spellings no longer around today in the States..."
Thanks, Mike. One of the first comments I hear about the book is: "Gosh, I needed sunglasses while looking at the cover."